There are a few introductory steps to local SEO for your healthcare office or clinic that can ensure your business listing populates when potential patients begin to search for you on Google. 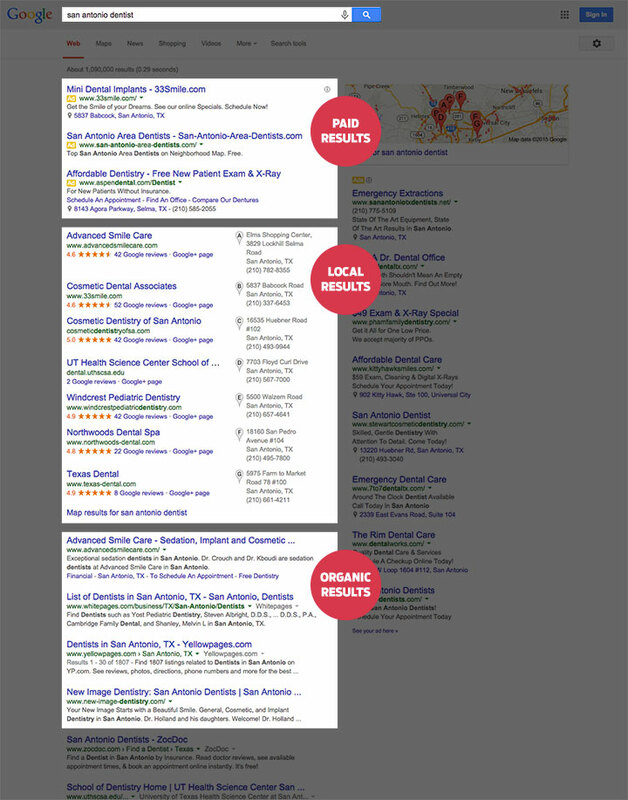 Whether you’re setting up a business listing for the first time, auditing an existing marketing campaign, or simply displeased with your current search rankings, we can help you set up a solid foundation that will immediately boost your local rankings and allow you to use more advanced SEO tactics in the future. Is this guide meant for me? You’re in the healthcare field and would like to establish or improve their local online business listings to attract more patients. You know your way around the Internet, but you’re far from a marketer or digital strategist. While it helps to be savvy with SEO from the start, even the first-timers will be able to complete these introductory steps to market their medical office or clinic online. Before Google released Google My Business last summer, managing local listings and content across Google’s properties was confusing, even for experienced marketers and savvy practice owners. Does your office already have a listing set up? You can find out by visiting Google+ Local and searching for your business name. If you notice multiple listings you didn’t know about, go ahead and remove duplicate entries if you, or your client, is the owner of the listing. If you don’t own the listing, here’s how to transfer ownership of a listing. You can also add managers (other admins) to the listing by following this tutorial. Keep in mind that changes made to your Google My Business page may not populate in search engine result pages (SERPs) for up to three days. Now that you’re officially set up on Google My Business, let’s move on to some quick local SEO best practice tactics for your website. Potential or current patients who arrive at your website organically may just be looking to see when you’re open. Never list your hours within an image, as crawlers from search engines won’t be able to read it. If you do have your hours within an image, ensure the ALT tag of the image includes your hours of operation. Lastly, make sure the hours on the website match the hours listed on your Google My Business page. Is your site structure set up well? How well is your content optimized? Beyond a Google My Business listing page, search rankings are affected by citations, which are simply a mention of your medical office/clinic with other supporting information, such as your website, phone number, address, or a combination of the three. The clinic owner or staff typically creates citations, but they can be automatically generated from a phonebook listing or data aggregators. While the SEO value of citations seems to be diminishing with every update to Google (especially Pigeon), they still play an important role when you’re trying to move up the rankings. Building citations for local SEO campaigns is a very time-consuming process, and we don’t recommend it for amateur marketers. Local listing information feeds from four primary sources—all of which need to be verified to have accurate information for each location. These four sources (along with Google My Business and a few others) supply all the major secured business listings sites with your medical office information (e.g., yellowpages.com, citysearch.com, superpages.com, bbb.org, dexknows.com, and others). Infogroup: Someone from the listed clinic office number needs to call and set up the account. Changes are effective after 45-250 days. Acxiom: Someone from the listed clinic phone number needs to call and set up the account. Changes are effective after 14-180 days. City Grid Media: Set up an account under admin@<your clinics extension>.com and verify all locations. Schema is a type of markup, or code, that is added to your website to make it easier for search engines to categorize and identify important information. Schema works to generate optimized rich snippets and improve overall ranking in search—it can even show potential patients extra information in the search results before your link is clicked, such as business hours, testimonials, and detailed information about your location(s). To learn more about schema and how to set it up on your own website, visit our blog entitled Local Search for Businesses. A constant flow of positive reviews is vital to the success of any medical office, no matter the size. In fact, review quantity, velocity, and diversity play roles in both in Google’s overall ranking factors, as well a major piece of the research-decision process. How do I generate more reviews? Consider create printed collateral to be given to the patient during their visit, listing where customers can review you or your medical office—review diversity is good for both patients and search engines, so be sure to offer a variety of places online where patients can review. What are popular healthcare-related review sites?